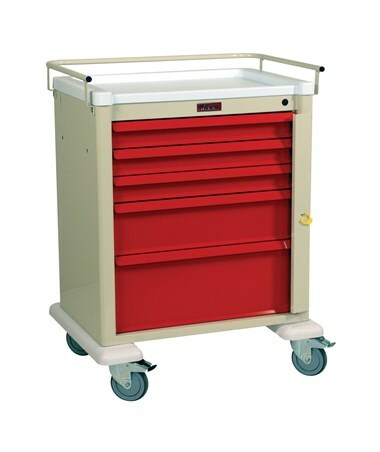 Harloff's Universal Aluminum Medium Five Drawer Crash Cart specializes in flexibility and durability to be the perfect partner in any hospital room. The strong, affordable aluminum construction features a durable powder coat finish (available in 16 colors) and modern design with industry-leading standard features. 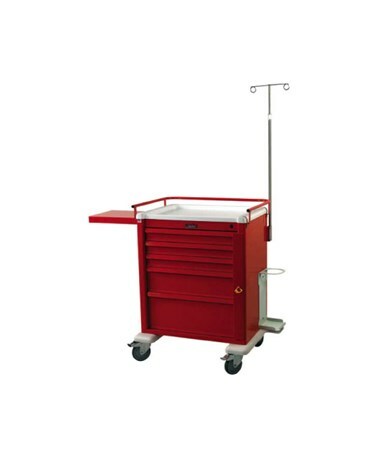 The cabinet provides customized drawer configurations, allowing the five drawers (operating on ball-bearing full extension slides) to be positioned in the 26" of vertical drawer space to best suit your needs. The five drawers included measure 3.25" (3), 6.5" (1), and 9.75" (1). 5" ball-bearing premium casters have an extended footprint to maintain stability when the drawers are extended. A protective pontoon bumper prevents damage from collisions and the painted steel top rail/push handle gives the user a high degree of control over the cart. 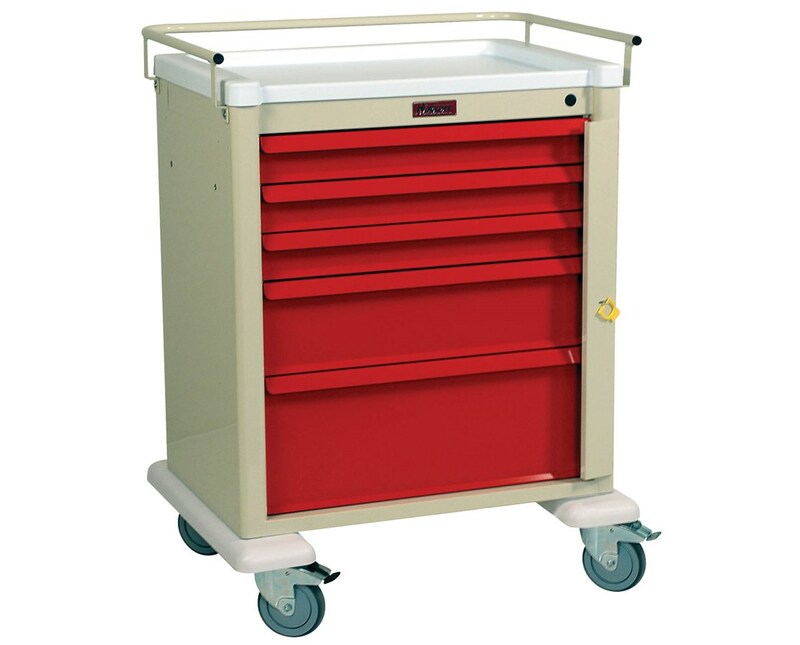 The versatility of this latex-free cart is impressive, thanks to its internal left-side pullout shelf, a removable plastic top, pre-drilled holes for accessories (many pre-threaded) and breakaway lock bar. We offer Harloff's Universal Aluminum Medium Five Drawer Crash Cart with either Standard or Emergency Packages, and in 16 colors as shown in this color chart. Select from the drop down menu above and order online direct by clicking "add to cart!"